To get started — look for the orange sign opposite ‘the pub’ — The Gladstone Hotel. 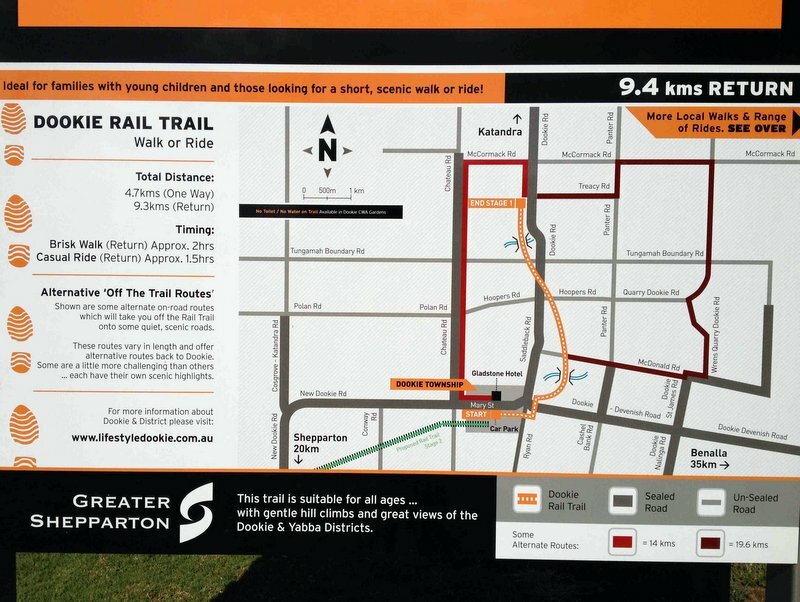 The map of the trail and useful hints is located at the edge of the carpark opposite The Gladstone Hotel. The ride begins — the entire track is sealed, and easy for all ages. 1km down (or in this case, 1km back to town). 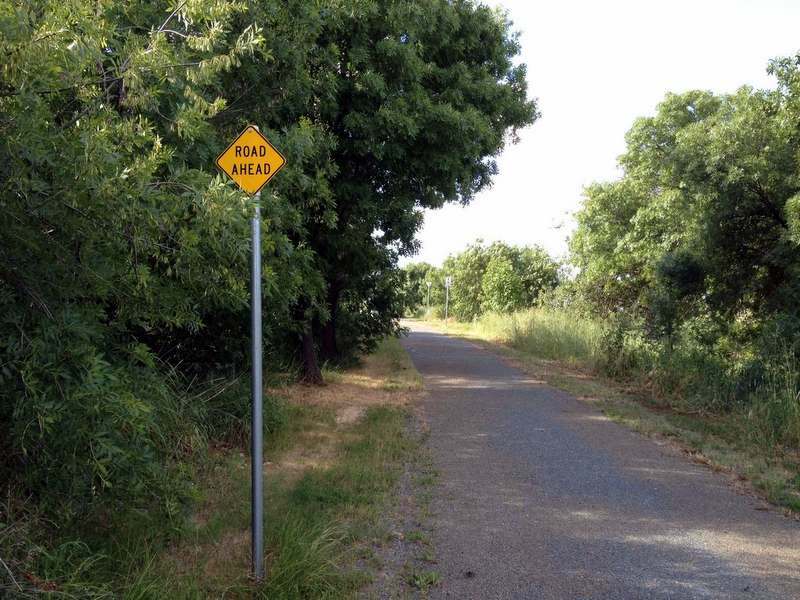 There are signs for cyclists (and walkers) the whole way along the trail, and there is only one spot where the trail crosses a ‘main’ road, which is well signed and has safety ‘barriers’ (the type you have to weave through). All streams and ditches can be crossed with serious bike-bridges. 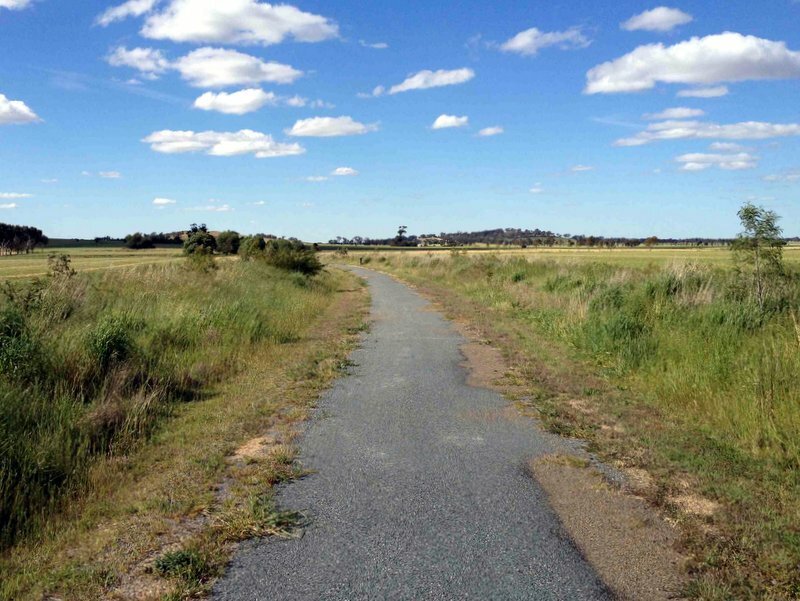 The rail trail is surrounded by paddocks and farmland. 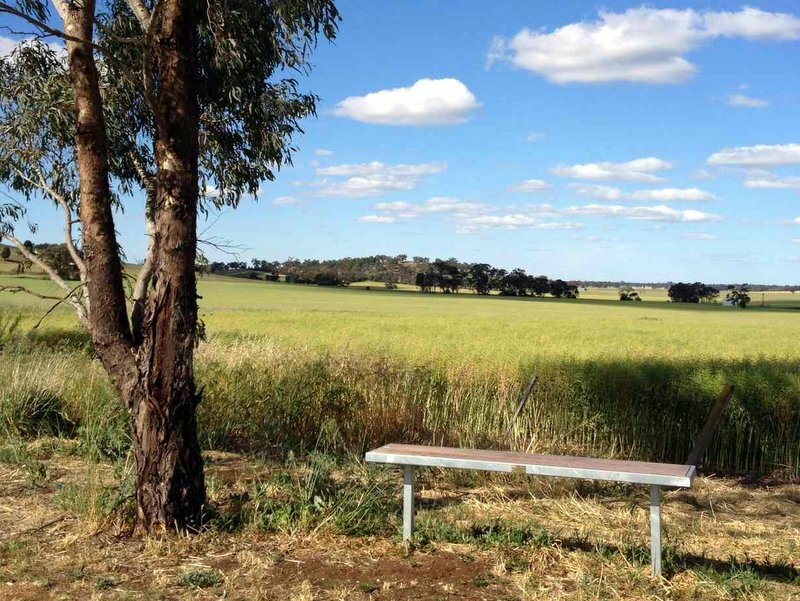 Seats are placed at regular intervals along the rail trail if you need a rest, or just want to stop and listen to the birds and smell the gumtrees. 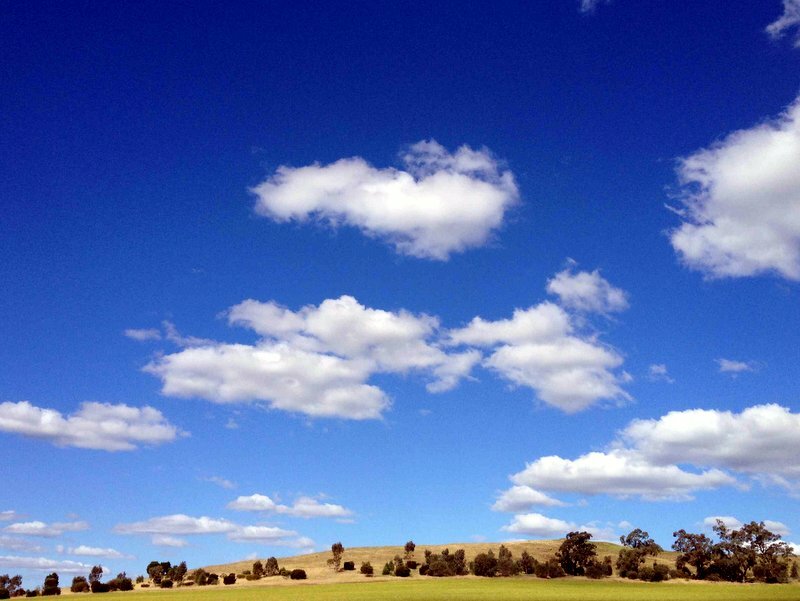 If you aren’t surrounded by paddocks, you will be surrounded by gumtrees. 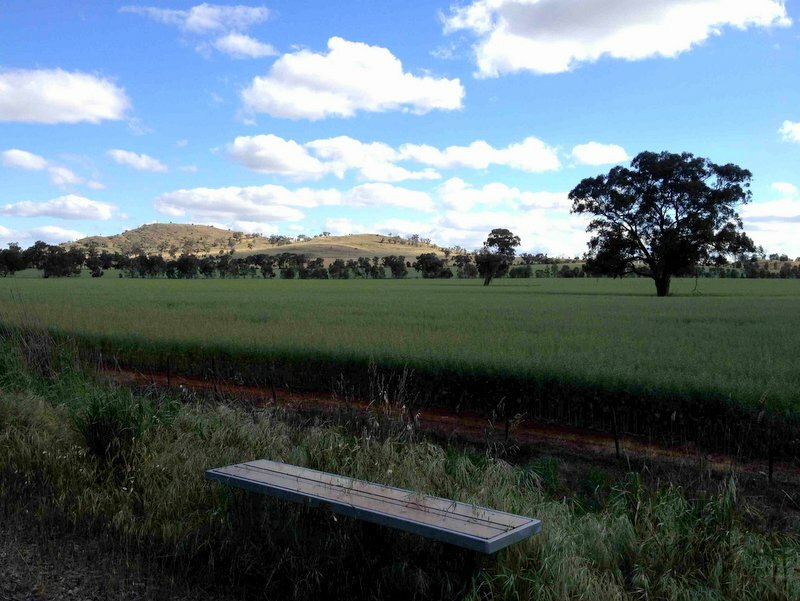 Almost at the end — another well-placed seat — crops in one direction and an olive grove in the other. 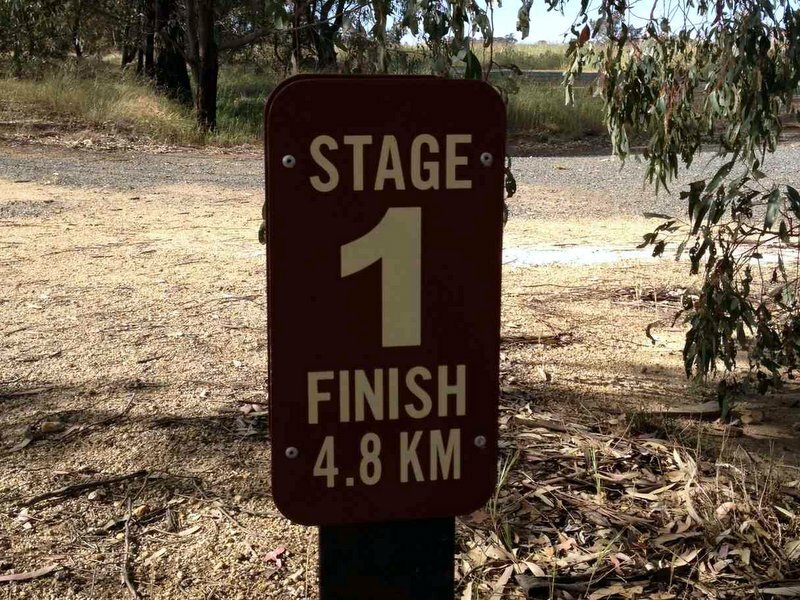 The end of the ‘stage one’ section of the rail trail. 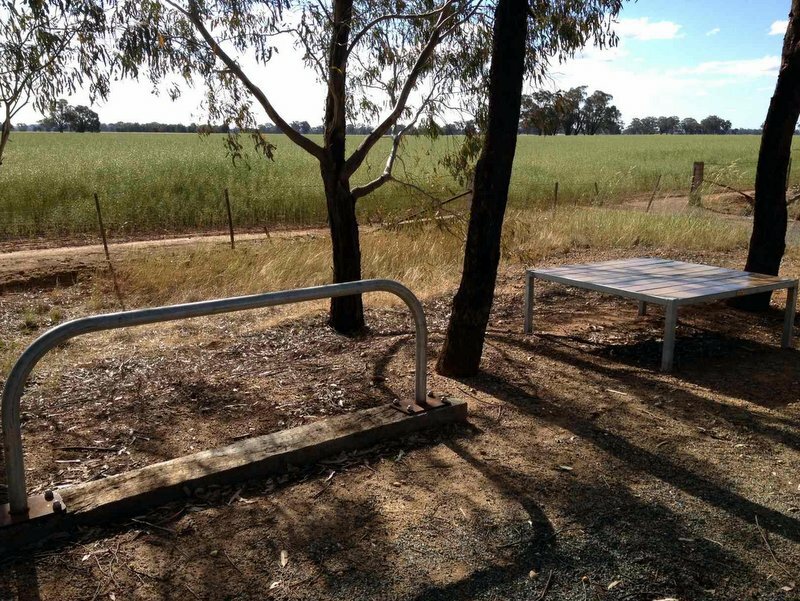 The seat and bike rack at the end of the trail — time for a stretch of the legs, or laying-out a small picnic by the paddock (take your rubbish with you!). Heading for home — Mount Major in the distance. 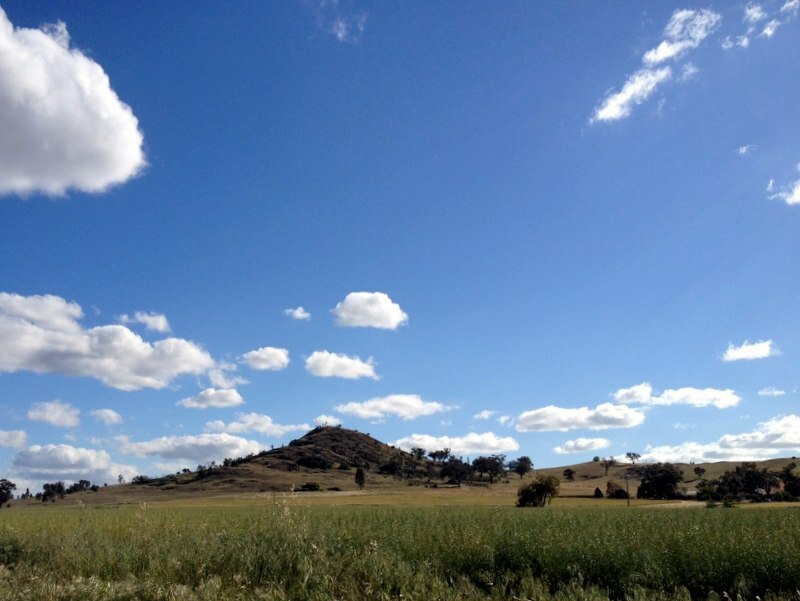 En route back to town, Mount Saddleback on the right (with St Mary’s Catholic Church ‘on the side’ of the hill if needing to say a little prayer). The Dookie ‘city skyline’ can be seen in the distance — the large ‘Rialto’ shaped building in the centre is the ‘Oats Silos’. Stop off at the Gladstone Hotel for a bite, or beverage up on the balcony. The Dookie Harvest Cafe at the Dookie Emporium, next door to the pub, offers a short sweet and savoury menu and a good coffee Fri-Sun; and the ‘Dookie Shop’ (milk bar) is a couple of doors down from the cafe. Rest in the CWA Gardens (which also has BBQ facilities). 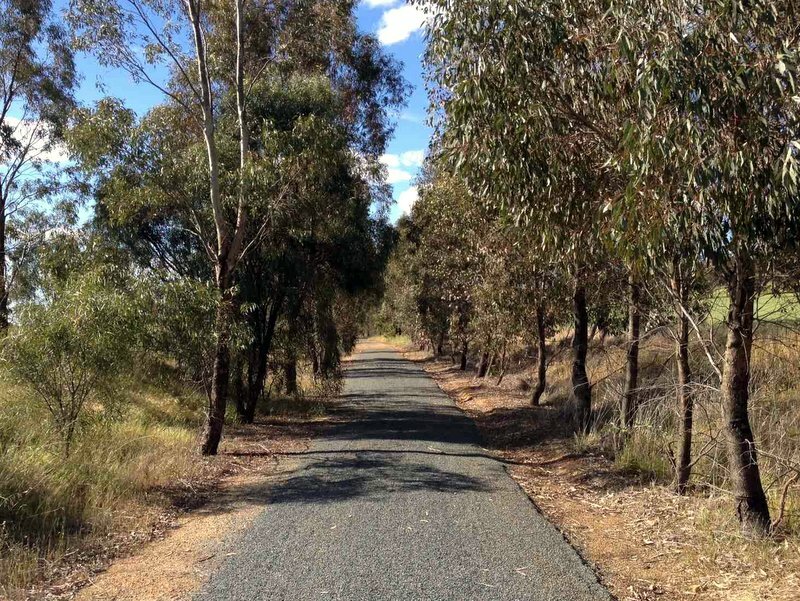 Keep an eye out for: Wallabies toward the end of the trail, just before the olive groves; brown snakes on the path (not common, but have been spotted); locals with their dogs — say hi as neither will bite. 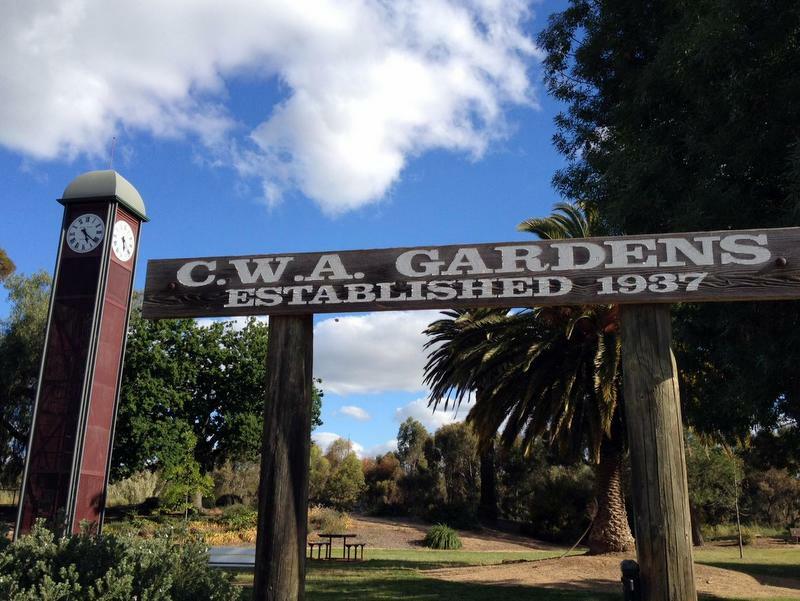 Practical notes: There are no toilets, bins or drinking fountains on the trail, but there are toilets in the CWA Gardens in the town (and a drinking fountain and bins). Plenty of car parking is available in the main street of the town, and under the shade of the trees opposite The Gladstone Hotel. 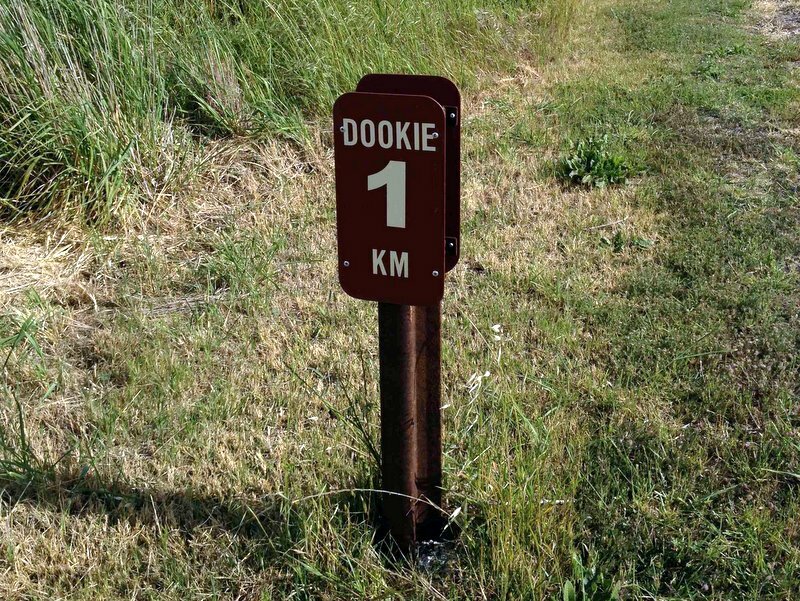 Getting there: Dookie is about a 2.5 hour drive north-east of Melbourne, either via Shepparton, or turning off at Violet Town on the Hume Highway to Albury. 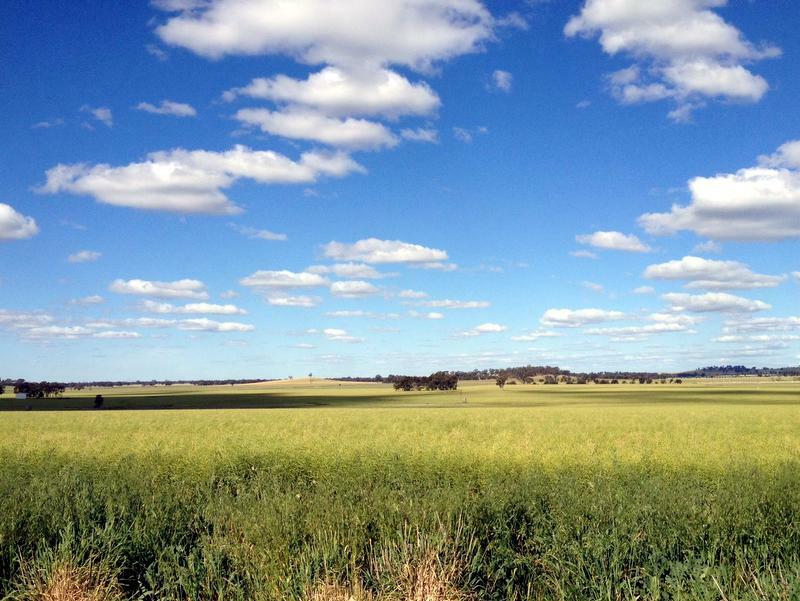 It is a 25 minute drive east of Shepparton, and an easy drive from Benalla, Wangaratta, Cobram or Echuca. The nearest VLine trains from Melbourne are to Shepparton or Benalla, but there is no public transport from these stations to Dookie. 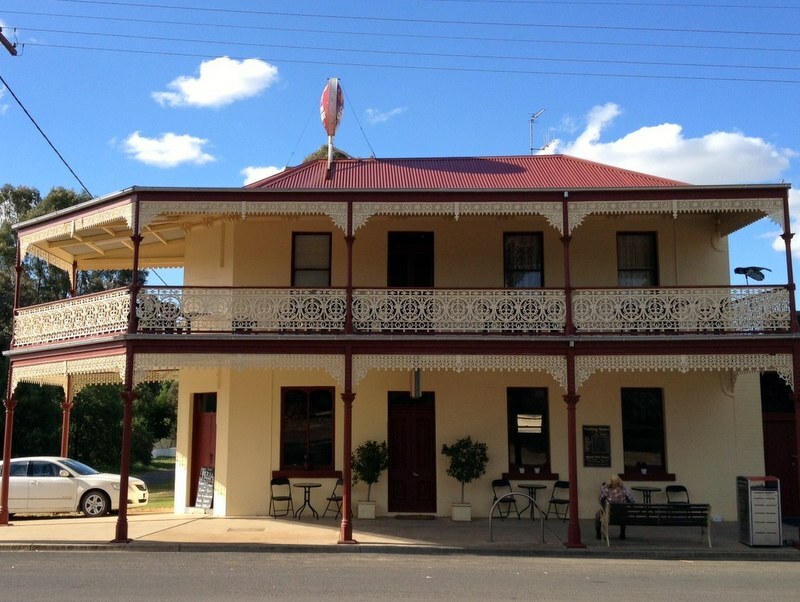 The Gladstone Hotel offers accommodation for those wanting a longer stay. 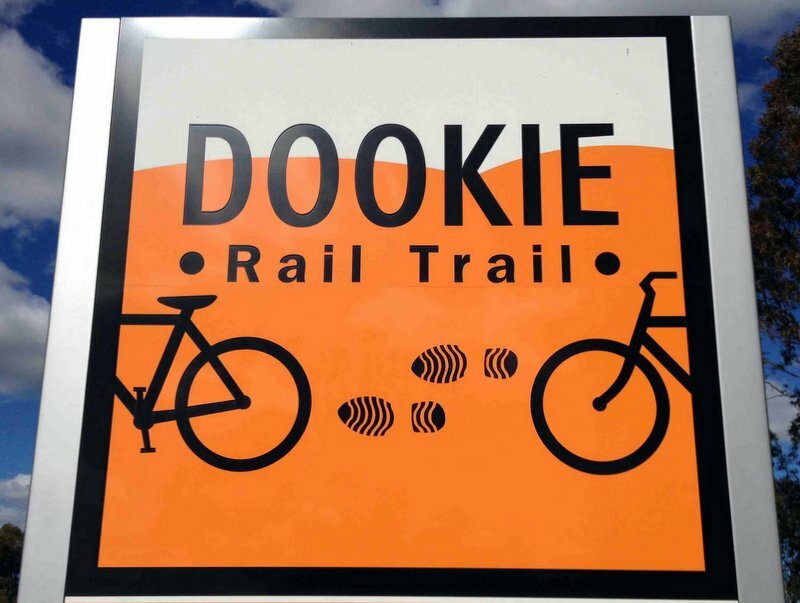 Printed brochure: More information (including some extra routes) is available on the downloadable Dookie Rail Trail brochure. 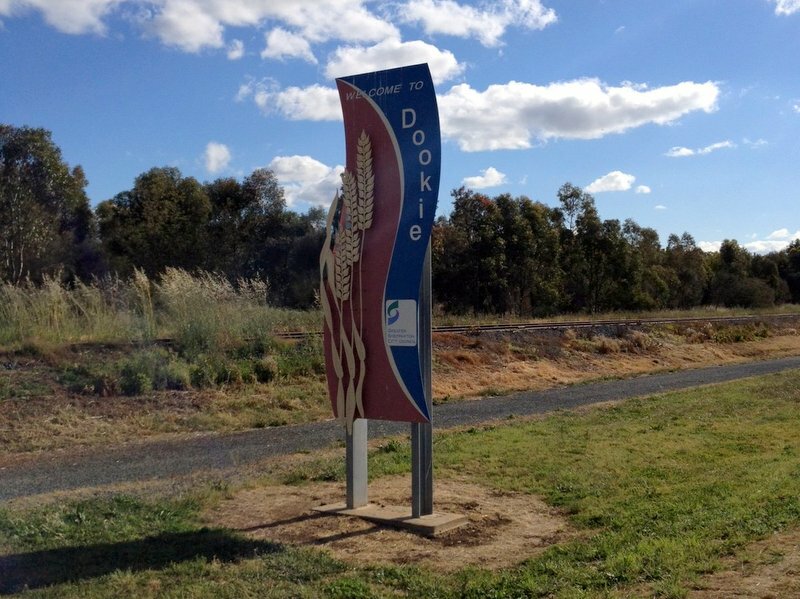 * The Dookie Rail Trail has hopes to be extended in the future, in the other direction, towards the Cosgrove Golf Course, and ultimately, towards Shepparton. 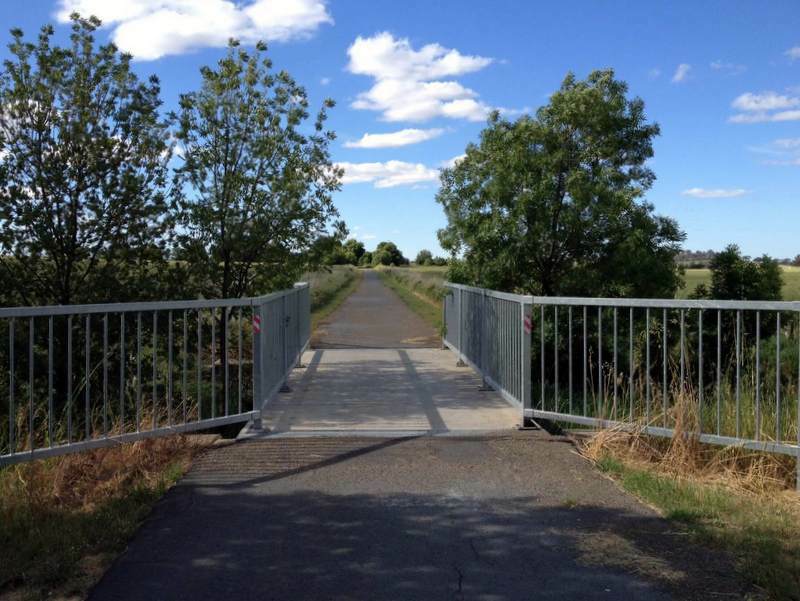 So after you have gone for a walk or cycle, be sure to get in touch with the City of Greater Shepparton and let them know how great it would be if they could help out with stage two. This is a great article. 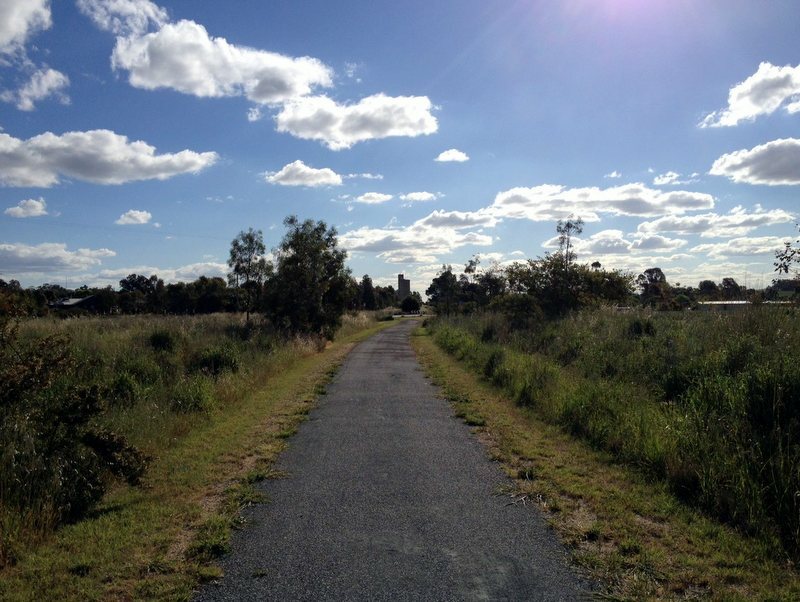 I think they have recently go the go ahead for extension of trail back towards Cosgrove…but I feel into the Moira shire would be as good or better. 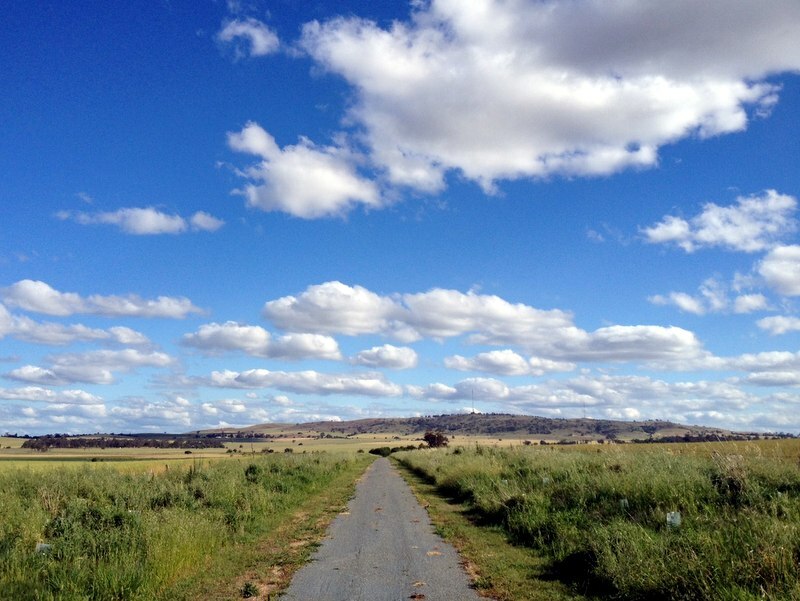 Thank you Amy, very informative article on the Dookie Rail Trail. I hope to walk the trail tomorrow, inconjuction with the opening of the new fitness equipment now placed along the trail.